ING Direct has agreed to take over the deposits and accounts of almost 200000 UK savers, from two banks: Kaupthing Edge and Heritable Bank. The latter is the UK arm of collapsed Icelandic bank Landsbanki. 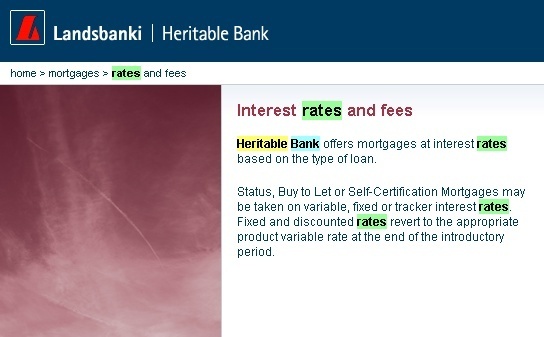 Heritable Bank offers mortgages at interest rates based on the type of loan. Status, Buy to Let or Self-Certification Mortgages may be taken on variable, fixed or tracker interest rates. Fixed and discounted rates revert to the appropriate product variable rate at the end of the introductory period. High interest rate � up to 6.55% AER* (6.36% gross�). We guarantee the interest rate will be at least 0.30% (gross) higher than the Bank of England Official Rate until 1st February 2012.